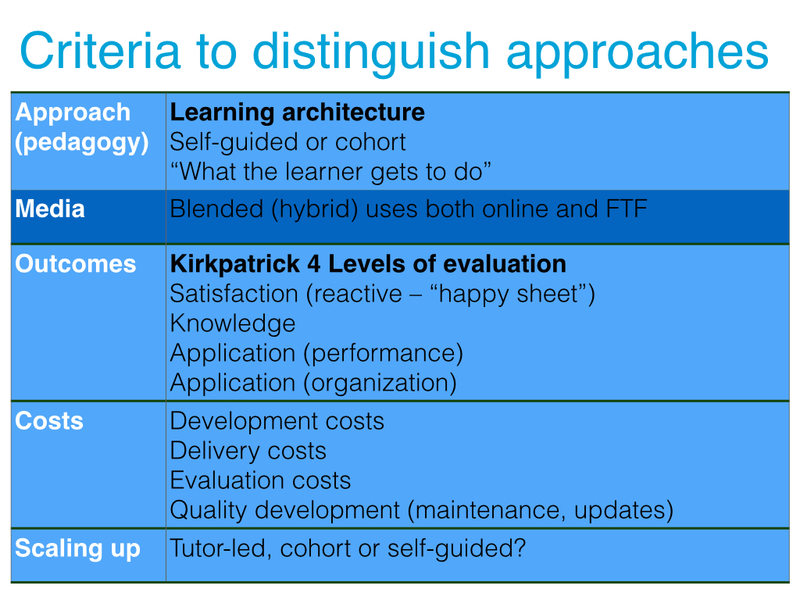 The table below summarizes criteria that you should consider to identify the appropriate approach for your online learning needs. At the top is the pedagogy and specific learning architecture. The key question is to ask: What does the learner get to do? Key decisions include the choice between self-guided learning (which scales up easily as it does not require synchronous interaction with other learners) and cohorts (which enable synchronous peer-to-peer relationships between learners). For a long time, a ferocious debate was waged between advocates of face-to-face learning who fetichized the value of IRL (“in the real world” interaction and advocates of online or distance learning. The evidence fairly definitively demonstrates that distance learning delivers slightly better learning outcomes, and that there is no learning efficacy benefit when you blend. However, your professional network is how you find your next job. It is also how you learn from others. Face-to-face contact is necessary for cultural reasons, at least for the current generation of humanitarians over 30. The bottom line is that in the humanitarian context, social relationships are so important that they provide the sole justification for a blended approach. Distance technology (read: Skype) can help scaffold, grow, and sustain these relationships and their value for learning, as can a well-designed online knowledge community. Next in the table are outcomes. The industry standard is Kirkpatrick. It really is that simple – and comprehensive. What is staggering is the dearth of learning evaluation in the sector. Training is assumed to be inherently good. This is no longer good enough, hence the necessity of not only reactive evaluation (the “happy sheet”) but the impact of learning on performance at both individual and organizational levels. When considering costs, one needs to distinguish development costs from the expenses associated with delivery and evaluation, as well as ongoing quality development. Often, an organization will budget for development without considering what training will cost to deliver. Last but not least, and I’ve written and presented on this extensively elsewhere, is scaling up. Self-guided learning scales up at low cost and cohorts do not (very easily). This intersects with the question of pedagogy.